It's been a long time. Ever since we beat EarthBound for the first time, saw Pokey's letter, pointing directly to a sequel, and had a memory of the words on the sign in Fourside: (Planning Meeting for EarthBound 2. Only those who are related to this project may enter. APE Software Developement Team) , we had our hopes set high for EarthBound 64. Even with the constant delays, which happened so often it became a running gag, we still brushed them aside, with our hope to be able to relive the adventure that brought us this far. However, as we all probably know, it is over. The following is a summary of the events that happened during this period, just to sum it all up. Keep hope alive, however. Hopefully EarthBound 2 will live. But it needs to be said. I give you this recent creation of Starmen.Net: The end of Mother 3. It all started October 22nd. icEFusioN was the first to find the horrid news, while checking out IGN. EarthBound 64 was cancelled. The link was here. The devestating shock that followed paralyzed the site. Why, you want to know? Well, according to IGN's report, it was full of problems and bugs, and Nintendo couldn't afford to have the game keep undergoing development when their new console was right around the corner. They needed to stop spending time on Mother 3. These aren't all the reasons, as you can find more later on. Shortly after that, a flood of unreleased media came in from Itoi's website. It was Itoi's way of saying 'Goodbye' to Mother 3, by giving his fans screenshots and media from the game. This can be found here (or check our screenshots page.) These screenshots show very close relations to Mother 2, and show the clear relativity between the 2 games. Although we lost a game we would have cherished, we need to move on. We were still not crushed. We kept hope alive in the petition, and searched for more information. On August, 22, we found our reasons at GameFan (I'd like to give you the link, but the information is no longer available.) EarthBound 64 was officially cancelled during a meeting between Iwata (a higher-up at HAL), Itoi, and Miyamoto. The reasons for the cancellation (as I'm sure you all want to know) appeared to be the fact of the upcoming system, the Nintendo Gamecube, and large projects Nintendo was working on. This lead to even more confusion than before, and all we kept hope in was the petition. Shortly after, we (Starmen.Net) started our "Letters to Itoi." Itoi's e-mail address was given out on the site, and the many members of Starmen.Net sent Itoi their letters. Although Itoi's English wasn't very good, he seemed to have understood what we were saying. He updated his website, first speaking about the unneccessary flames he got in his inbox, but later talking about the people who e-mailed him who truely understood him, Mother, and what he was doing. It was a mixed reaction, which did not exactly answer our questions, or give us what we wanted, but it was simply the way he wanted it to be. After our "Letters to Itoi", on September 6th, 2000, we finally finished our goal of 10000 signatures on our Mother 3 petition. With 10,013 signatures, making 700 pages, and totaling 3.79 megs, the petition was finally complete. There was much rejoicing, and shortly after, it was sent. The wonderful cover, designed by reidman, can be found here. After the petition and our Letters to Itoi, we didn't do much afterwards concerning Mother 3. We had done all we could; we're only one site, and not a huge name site like most. Even though we didn't receive much of a response to the petition, we had done something incredible for a bunch of insomniacs who all love the same game. After the petition and our letters to itoi, Starmen.Net laid dormant, but there was still some news popping up from time to time concerning Mother 3. In October, IGN published a poll about the Gamecube from Famitsu Magazine. In it, one of the questions was "What game do you want most on the system?" With 4000 replies, in 5th was "New Mother Game." It seems that they want mother a lot in Japan! You can find that article here. 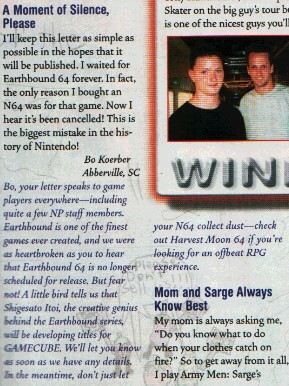 There was also a letter printed in Nintendo Power from one of the many Earthbound fans. It was from a fan who had pretty much bought an N64 for Earthbound 64, and was quite unhappy about it's recent cancellation. The reply gave us some hope; Nintendo said that Itoi will be developing for Gamecube. It did not specifically say that it would develop Mother 3, but it's more than enough to give us hope. You can see a scan of that article here. Another bit of news appeared in IGNCube's Q&A section. A letter about Mother 3 for Gamecube. The response was not good, reducing us to only a shimmer of a hope, but we still have hope. Basically, it said that IGN had asked Miyamoto about Mother 3 for Gamecube, and Miyamoto said there were no plans to bring it to the Gamecube. It also said that it was brought down because the development team was not familiar with 3D. You can find that report here.